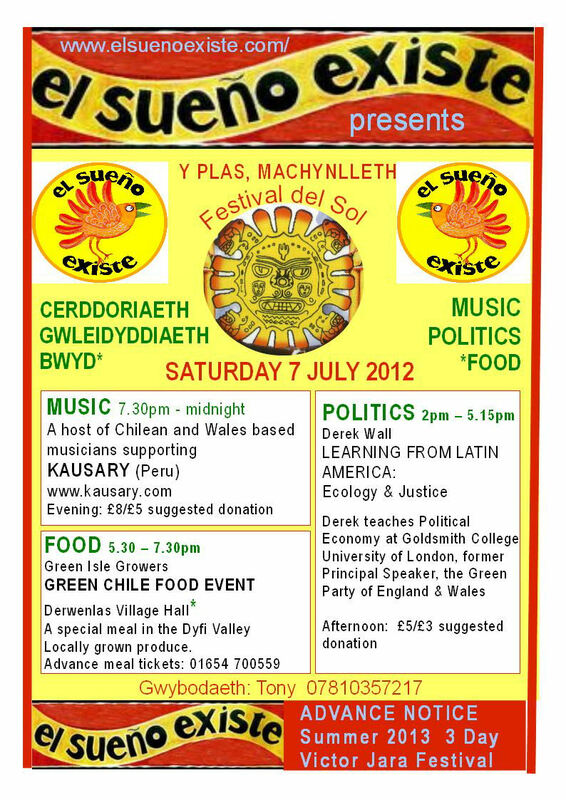 Our “Festival del Sol” on July 7th sees the return of fantastic Peruvian band Kausary to Machynlleth. Kausary means “revive” in Quechua and the band were a big hit at last year’s El Sueño Existe. They play a highly charged mix of Andean folk and salsa chicha and will have everyone dancing the night away. In the afternoon, author of “Ecosocialism; the Rise Of The Green Left”, Derek Wall will present a talk entitled, “Ecology And Social Justice: Learning From Latin America”. Wall is a former principal speaker of the Green Party and campaigns for Socialist and Environmental issues. There will also be a presentation by Flor Rodriguez on Peruvian Marxist writer : Jose Carlos Mariategui. José Carlos Mariátegui La Chira (14 June 1894– 16 April 1930) was a Peruvian journalist, political philosopher, and activist. A prolific writer before his early death at age 35, he is considered one of the most influential Latin American socialistsof the 20th century. Mariátegui’s most famous work, Seven Interpretive Essays on Peruvian Reality (1928), is still widely read in South America. An avowed, self-taught Marxist, he insisted that a socialist revolution should evolve organically in Latin America on the basis of local conditions and practices, not the result of mechanically applying a European formula. His writings have strongly influenced the “Pink Tide” of socialist revival throughout Latin America. There will also be a “Green Chile” food event with locally grown vegetarian food from the Green Isle Growers.